The housing application process lives within the eHousing student portal. You will login to eHousing with your EUID and password to apply for upcoming terms as those applications periods become available. You do not have to be admitted to the university before starting an application for housing. Due to the cancelation terms and the binding nature of the License Agreement, we want you to fully understand the agreement you will sign during the application process. Note that an application payment is required to complete the application and secure your selected hall and room preference. Taking time to understand this information prior to starting your application will help you make the best decision for your future. Check out a quick video that highlights the application process that you'll be completing to secure a room assignment prior to arrival on campus. 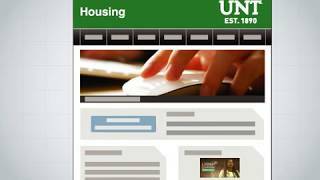 There is an exception to the first-year housing requirement policy for commuter students that can be found here: UNT Policy 07.008. If you intend to commute as a first year student, we require you to submit completed paperwork for verifcation of exemption from the first-year live-on requirement. It is recommended that you review the information about properly completing the commuter exemption process.